This diamond twisted shank engagement ring with a center cushion cut aquamarine seems to be a customer favorite. You can select from a variety of metals, but I prefer white gold with the diamonds and aquamarine center. The twisted diamond shank features hand set pave diamonds. No detail has been overlooked with this beauty! If you love Kate Middleton’s engagement ring (note that it was also Princess Diana’s engagement ring), then you will go gaga over this aquamarine and diamond similar version. This diamond halo setting holds a 7×5 AAA quality oval aquamarine gemstone. Obviously Kate’s engagement ring features a blue sapphire, but this aquamarine stunner is a showstopper, too. If you are interested in an aquamarine engagement ring and you are on a tighter budget, be sure to consider this classic round aquamarine solitaire engagement ring. 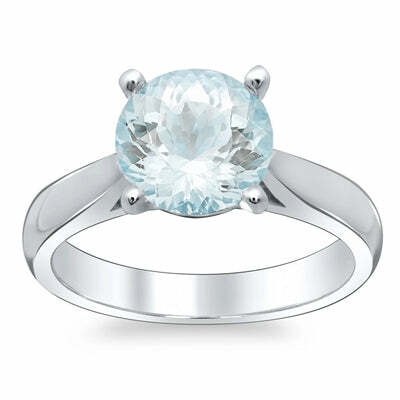 The center round aquamarine is 8mm and weighs approximately 2.00ct. Currently starting at less than $900, this is the perfect engagement ring for the bride-to-be with a March birthday! If you are interested in aquamarine jewelry and aquamarine engagement rings, deBebians.com has you covered. 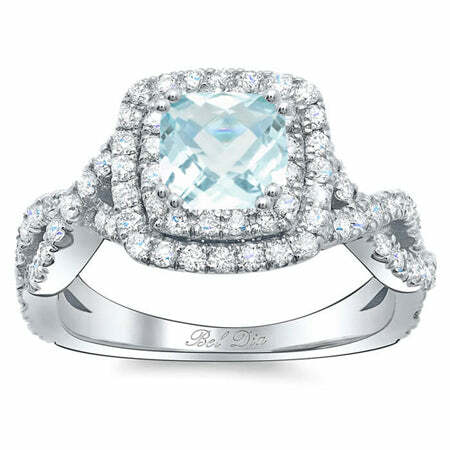 Be sure to check out our aquamarine engagement ring section. Contact us if you need further assistance. 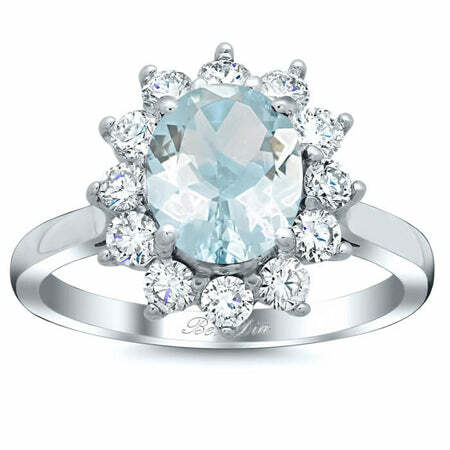 Please note most of our engagement rings can be set with an aquamarine center. Happy shopping!